Tile Stencils for DIY Painted Tile - Easy Remodel - Just Stencil Your Tiles! This beautiful Calista Tile stencil is inspired by the ever popular cement tiles. Use this design to stencil a kitchen backsplash or to create a stenciled floor. 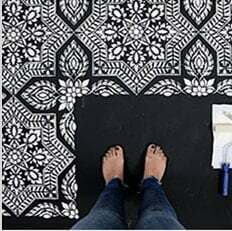 Stenciling over existing tiles is a great money saving DIY painting project. We have a great assortment of tile stencils for you to choose from. Which stencil paint to use? You can stencil with acrylic or latex paint, stencil creams, glaze, etc. It's best to have your walls painted in flat latex paint as it makes a perfect base coat for stenciling. For stenciling on tile floors, use Stix adhesive primer as your base coat, tinted to the color of your choice and then stencil with latex or acrylics as usual. Seal your stenciled tile floor with 2 coats of acrylic polyurethane. We do not recommend oil paint or spray paint for stenciling. Use a dense foam roller or stencil brush. If you want nice crisp edges, using spray adhesive may be very helpful (Elmer's seems to be the best) to ensure minimal bleed. Please make sure you watch our short step-by-step Video Tutorials! You'll find them extremely helpful for your stenciling project.